Bisaya In Manila: The Tastes & Flavors of Bangkok: Sawasdee Ka! 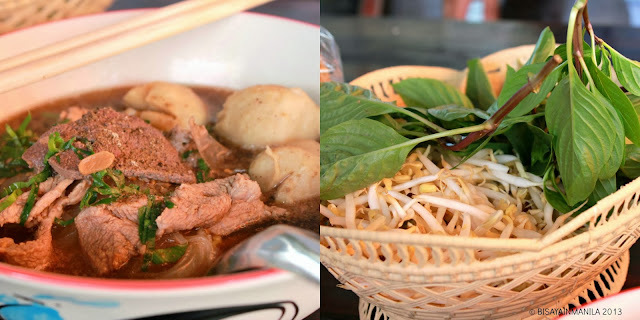 The Tastes & Flavors of Bangkok: Sawasdee Ka! Just a few months ago, I was lucky enough to travel once again to Thailand for a work meet. Eagerly I anticipated the visit to temples this time as well as tasting yet again authentic Thai dishes. We went to a lot of different restaurants and I was a bit pressed for time at work so I was not always able to document what I ate and where but it was yet again a pleasant interlude into the land of elephants. Below are the pictures I was able to take eating my way around BKK. Enjoy! Upon arriving in BKK and after we got settled in our nice hotel, we were taken by our boss to this wonderful cafe inside a mall. Very quaint and very quirky. They had nice interiors and an even nicer menu offering plus the gorgeous French cafe manager who we got to know. He even spoke Filipino! Grilled Smoked Salmon and Avocado sandwich! Yum! For dinner, we got to eat at this Chinese restaurant which served both Thai and Chinese food. We had some Thai staples including the customary Thai Iced tea and of course Pad Thai. All the food that we had at this place was really good. No complaints here! Part of our work itinerary is of course listening to good music as we are in the entertainment industry. We watched a show at the Sheraton in BKK and had some drinks as well. Lovely Pica Pica for free! I had a mini white wine tasting thing going on too! I love the Sheraton! And then, there were the out of the way stores and cafeterias selling really cheap but really good food which me and colleague A went out to explore. Chicken in green curry sauce! Always present in Thai restos. Their 4 basic needs for sauces. As always Thailand/Bangkok does not disappoint in terms of food. There are just so many interesting dishes that I have yet to try in Thailand and I'm sure I will be back sometime soon for another food feast again.